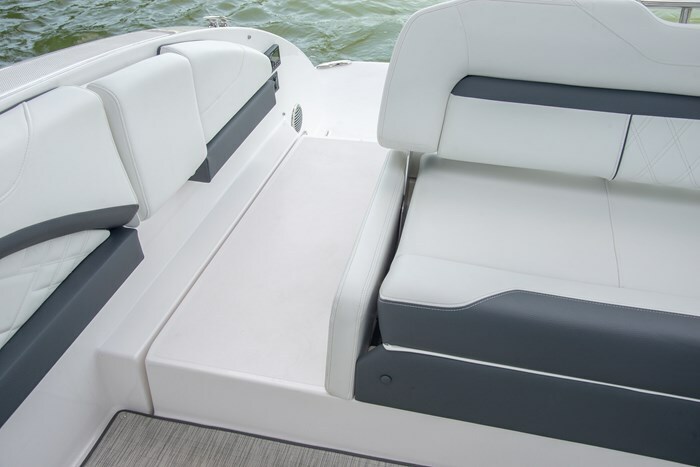 Bowriders are becoming more in fashion and more in demand and as a result, are becoming increasingly larger and offering more features and added flexibility. Take well known Regal Marine of Orlando, Florida for example. 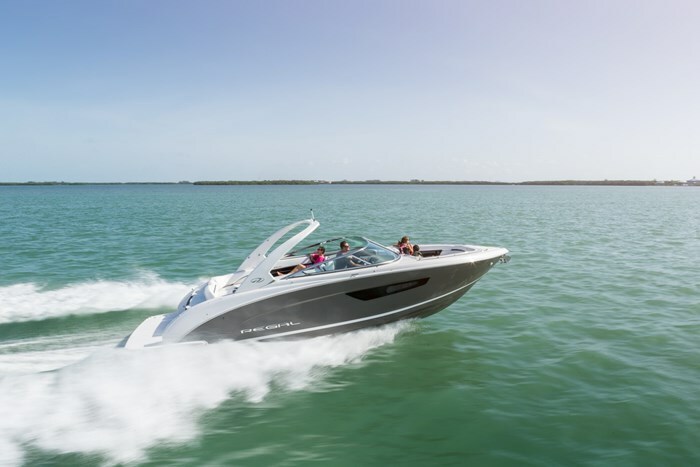 Regal now offers a total of twenty-seven models of bowriders from nineteen to thirty-three feet; fifteen of which are sterndrive powered, eight of which are outboard powered, and four of which are “Surf” models featuring Volvo Penta’s Forward Facing Drive. The 3300 Bowrider is the largest of its bowrider offerings at 34-feet, 2-inches LOA (Length Overall) on a 10-foot, 4-inch beam. 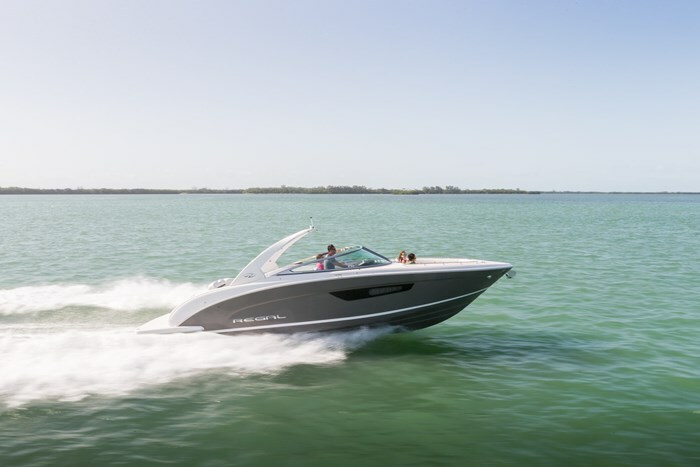 Its sister model, the 33 OBX is the same size and offers virtually identical amenities but with twin outboard power. 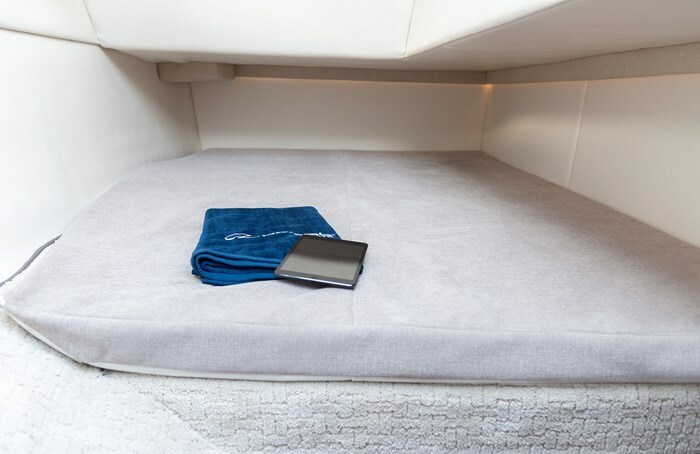 And when we say “more features and added flexibility, whoever would have thought a few short years ago that any bowrider would offer reasonable overnight or weekend boating accommodations complete with a queen-size berth, stand-up head, and full cooking facilities! Well look no further because this is exactly what Regal’s 3300 Bowrider offers. The 3300 rides on Regal’s deep-vee 21-degree deadrise hull design providing a smooth ride when the going gets rough. It is constructed using Regal’s relatively new “Fusion Technology” which is essentially a vacuum bagging process to ensure better distribution and penetration of the resin throughout the fibreglass cloth for greater strength, integrity, and lighter weight. 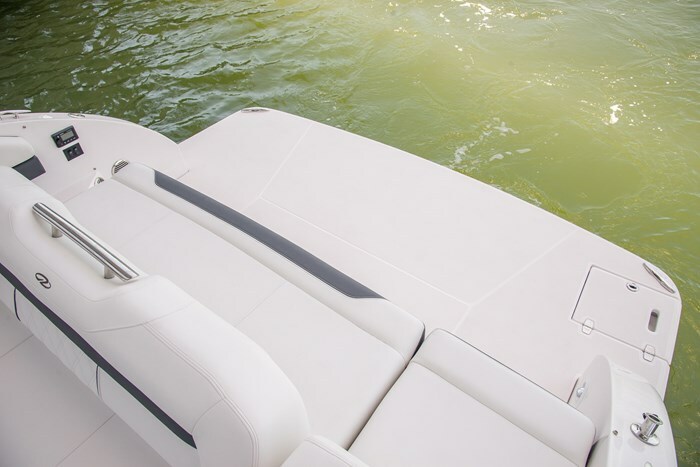 A vinyl ester barrier coat on the hull bottom is a standard feature. Choose from eight hull colours (plus white) plus from eight in-gelcoat bootstripe colours in three distinct styles. The 3300 is available with a total of 600 horsepower gasoline power from either twin Volvo V8 300 EVC (Electronic Vessel Control) with Joystick Control, Duoprop drives, and Electronic Shifting or from MerCruiser twin 6.2L 300 DTS (Digital Throttle and Shift) with Bravo 3 drives and Electronic Shifting. Mercury Axius Joystick Control is optionally available. You could also choose twin Volvo V8 380 engines with similar features as above or, if diesel is your preference, twin Volvo Diesel D3’s with similar features. 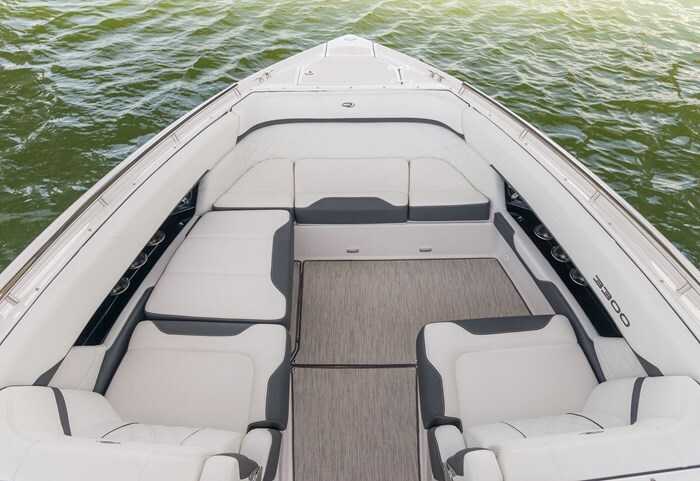 The 3300 offers seating for as many as eighteen persons which you may never want aboard, but suggesting there is ample leg and elbow and move-around room for almost all family pleasure boating activities. 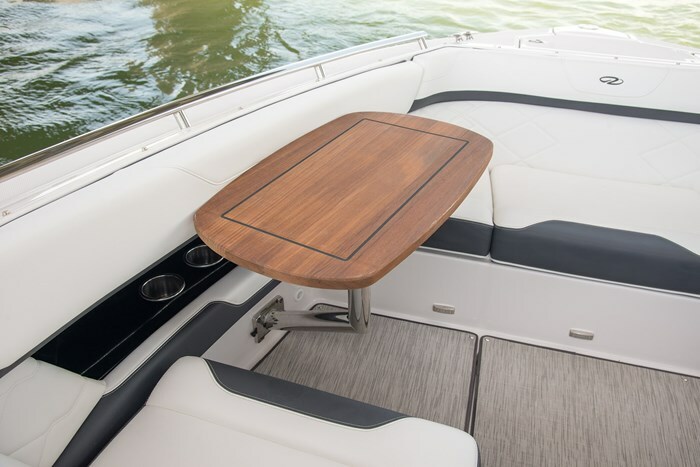 Regal’s popular and versatile “UltraLounge” centers across the transom offering forward or rear-facing seating plus two-position rear-facing lounging or fully reclined for a huge sunpad. 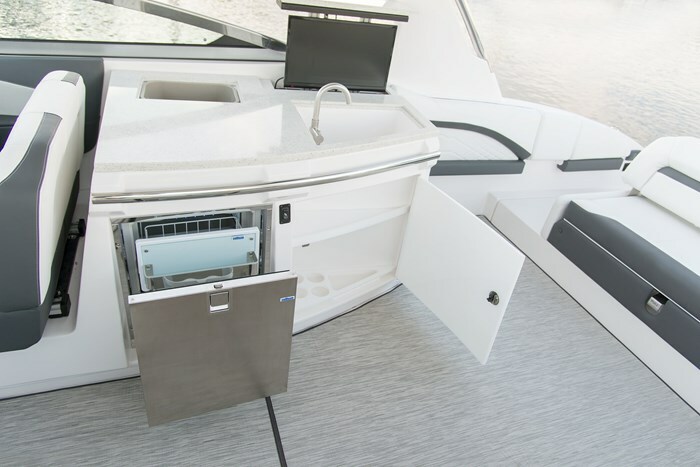 A starboard side transom walk-through facilitates access to the large swim platform. A flip-down step aids starboard side boarding. 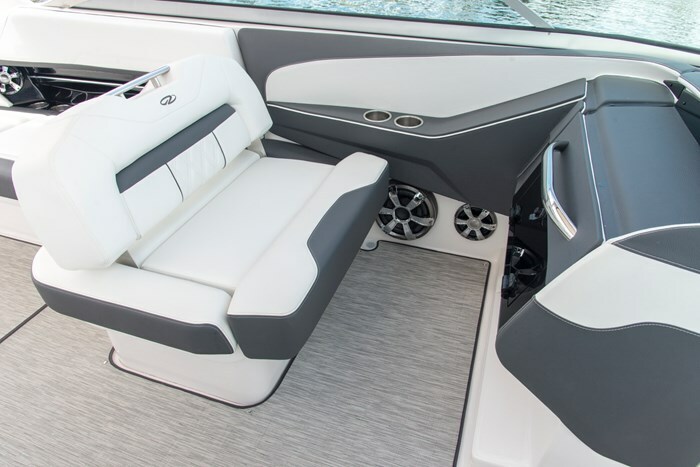 This transom UltraLounge mates to a full length port side lounge seat which stretches almost to the passenger helm where a double-wide seat with a flip-forward backrest offers forward seating or rear-facing lounging. The driver’s seat is also double-wide. 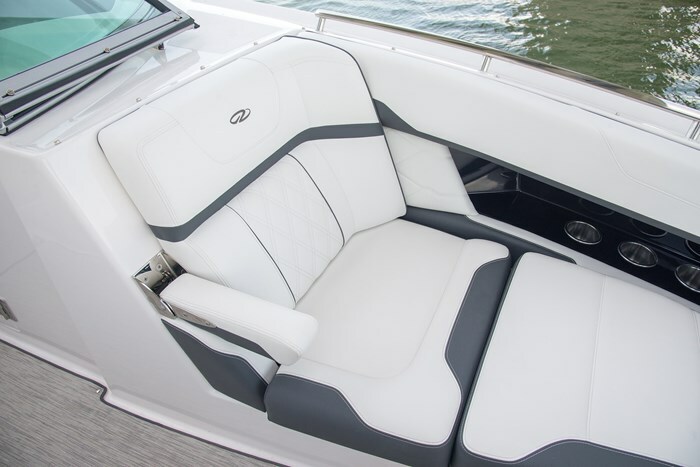 In the bow, forward facing seats ahead of both helms offer flip-up armrests and the port side seat extends forward and around the bow, beneath which is a built-in cooler. All other seats have deep storage areas beneath the seat cushions. 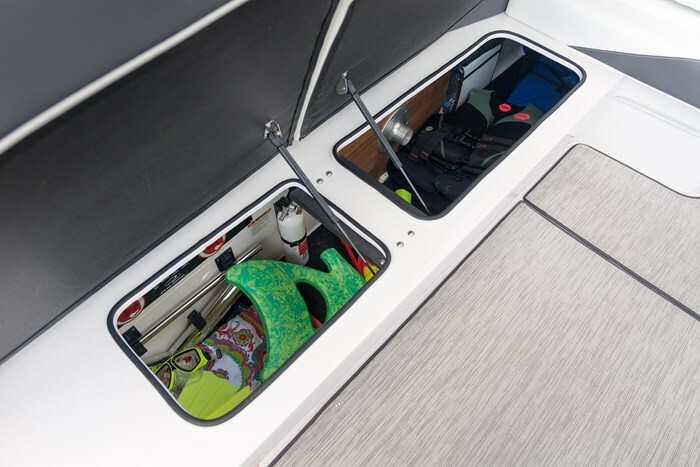 A bow in-floor storage compartment is provided. Lift the starboard side bow seat cushion ahead of the driver’s helm and step down into the “cabin” called a quarter berth but complete with a queen-size bed stretching back under the cockpit sole. To port, within the passenger helm is a full stand-up head compartment complete with a vessel sink, “Moon Crystal Solid Surface Counter Top”, and “Soft Step” flooring. An electric head with holding tank is optionally available. Large hullside windows provide natural lighting to both the cabin and the head. An opening portlight with screen is optionally available. The driver’s helm features a standard Garmin GPS touchscreen providing all engine instrumentation readouts plus a chartplotter. 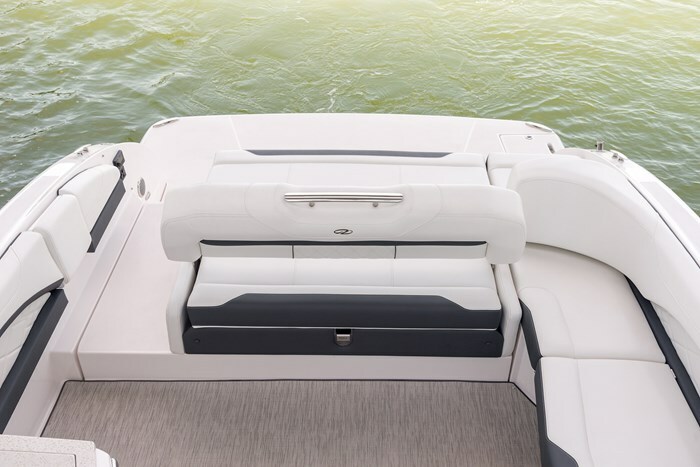 A digital depthsounder is standard as is a Bluetooth compatible Fusion UD750 marine stereo with six cockpit speakers plus bow and transom remotes. Optionally choose a 12-inch Garmin plotter, VHF, sonar, radar, or go all out with Volvo’s 12-inch Glass Cockpit with autopilot. 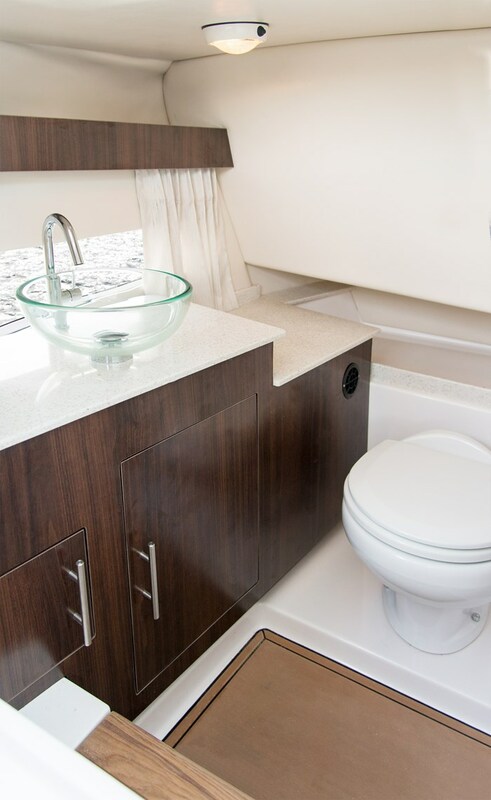 Aft of the driver’s seat is a standard refreshment center complete with a refrigerator, sink, trash container, and storage. A second drawer-style refrigerator is available as is a gas or electric grill. 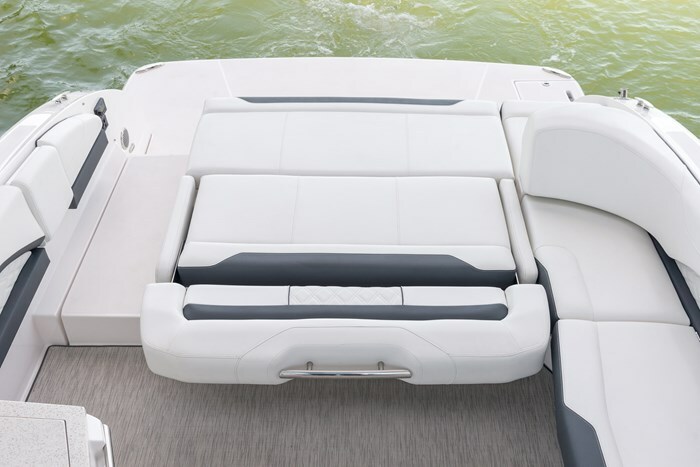 Overhead, Regal’s “Power Tower” in black or white with bimini is standard. A full enclosure is available as is a hardtop with a sliding sunroof to which you may add an electric retractable Sureshade. Four colours of canvas are available. 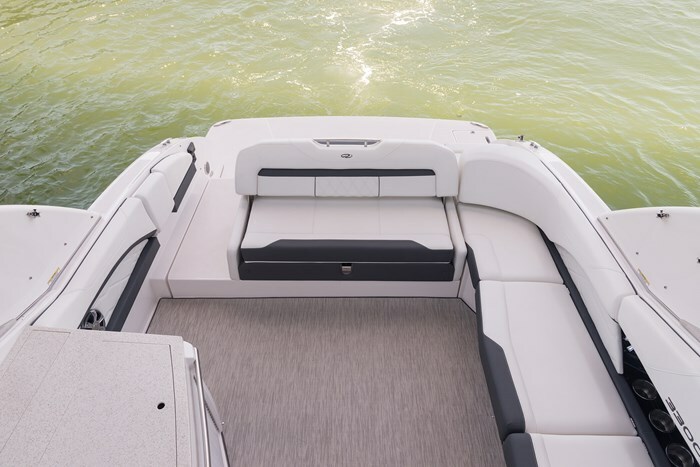 A host of available options will allow you to personalize your 3300 Bowrider to your ultimate taste and needs. 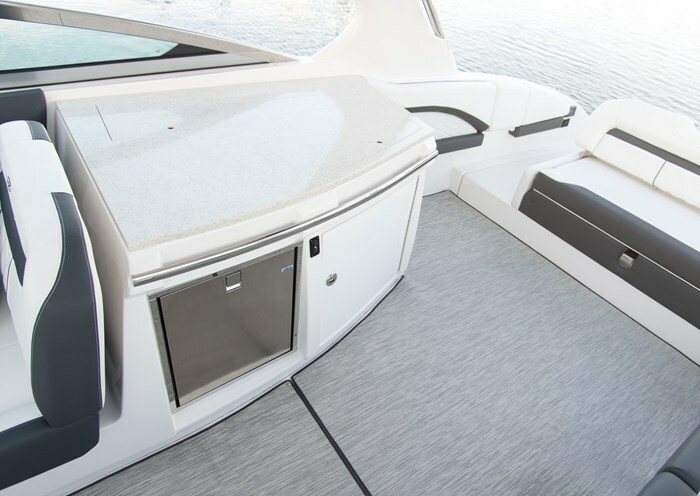 Choose various floor coverings for the cockpit and transom areas, a Premium Package providing a bow filler cushion, cockpit table, and storage mats; a Power Package providing shore power, battery charger upgrade, microwave, outlets, electric stove, and electric power for the water heater; a Technology Package which includes a battery charger, power helm seat, docking and underwater lights, plus a stereo performance package. Perhaps add a generator, bow thruster, bow walk-thru doors, cockpit TV, extended swim platform, windshield wiper, removable ski tow pylon, and fender clips, among many more.